By now you’ve most probably heard of the so called Internet of Things (IoT), which is being built today. The Internet of Things refers to uniquely identifiable objects, or things, and their virtual representations in an Internet-like structure. 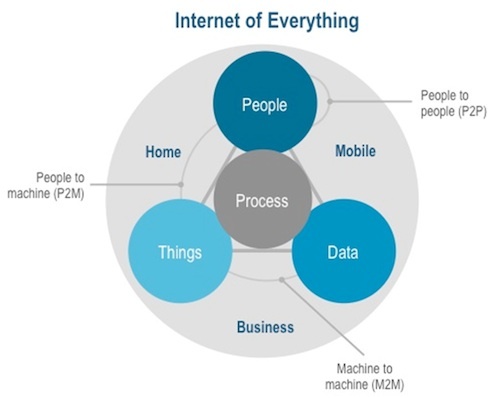 However, already there is talk of a next phase called the Internet of Everything (IoE). Cisco has recently explained on their blog that within the Internet of Everything, things will gain increased processing power, context awareness, and greater sensing abilities. Dave Evans from Cisco points out that we are entering an era where “the Internet has the potential to dramatically improved the lives of everyone on the planet – from curing disease, to understanding climate change, to enhancing the way companies do business, to making every day more enjoyable”. Evans explains that the Internet of Everything will involve a network of networks where billions or even trillions of connections between people, information, and things will create unprecedented opportunities and “give things that were silent a voice”. He asserts that the Internet of Everything will provide richer experiences, new capabilities, and unprecedented economic opportunity for businesses, individuals, and nations. According to Metcalfe’s law, as time goes by more and more people, data, and things are becoming connected, so the power of the Internet will continue to grow exponentially. According to Metcalf, the power of the network is far greater than the sum of it parts, so the Internet of Everything will be very powerful indeed. Cisco points out that currently more than 99% of things in the physical world are not connected to the Internet, but more things are becoming connected every day. The Internet of Everything will serve to “wake up” a great deal of the things in our world. By using microsensors, everyday objects (things) can become “connected and intelligent”. By 2020, it is thought that 37 billion things will be connected to the Internet. What are your thoughts on this new concept of the Internet of Everything? Do you think it will change the world for the better?